If you've got your eye on the 2019 Keystone Montana 3811MS 5th Wheel then Lakeshore RV Center in Muskegon is the RV dealer for you! We have the nation's lowest prices on all the top brand RVs with fantastic financing to meet every family's budget! We're conveniently located at 4500 E Apple Ave Muskegon Michigan 49442 and our friendly, knowledgeable staff can help make your RV dream come true! Stop in and see us today! 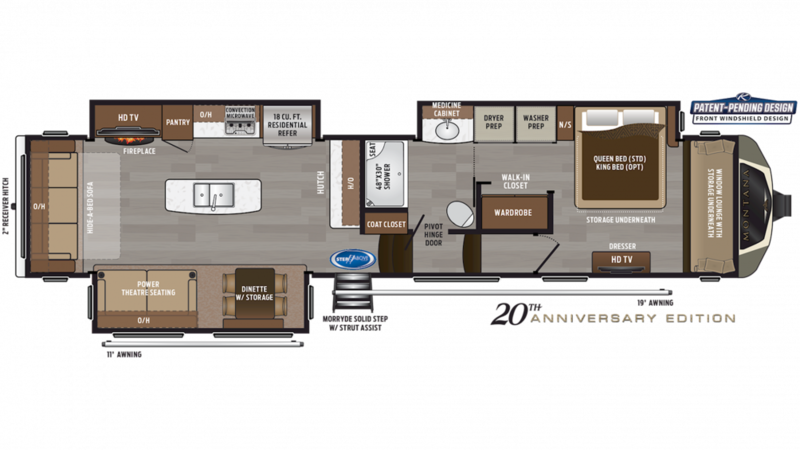 You'll be on the road to great family fun in your new 2019 Keystone Montana 3811MS before you know it! The exterior of this dashing RV features a 19' 0" awning, providing some much-needed shade and protection from the elements! You can go further with this RV, which boasts a GVWR of 16750 lbs, a hitch weight of 2780 lbs, and a ship weight of 13350 lbs! The 2019 Montana 3811MS is roomy inside at 40' 9" long and 8' 0" wide, with its 3 slides that maximize the living space! And you'll enjoy a perfect climate inside no matter what the weather thanks to the efficient 15000 BTU a/c unit and the modern 35000 BTU furnace! There's nothing like a spacious, handsome master bedroom to sleep in when you're on the road, and this 5th Wheel has a great one. Lots of storage for clothes and a roomy, comfy Queen bed! Up to 4 people can sleep comfortably inside! Your family will enjoy great meals with the kitchen, which includes a 3 burner cooktop stove and a 18.00 cubic foot refrigerator that will let you stock fresh food, fruits, and veggies! Don't worry about the kitchen running out of water, with the 66 gallon freshwater tank! The 88 gallon gray water tank and 49 gallon black water tank have enough tank space for your entire trip. The bathroom's shower and Porcelain Foot Flush toilet prevent long trips to the communal bathroom. The LP tank's capacity of 60 lbs. ensures that your showers will stay pleasantly hot! There is a fireplace that provides warmth inside this luxury RV on the coldest nights!